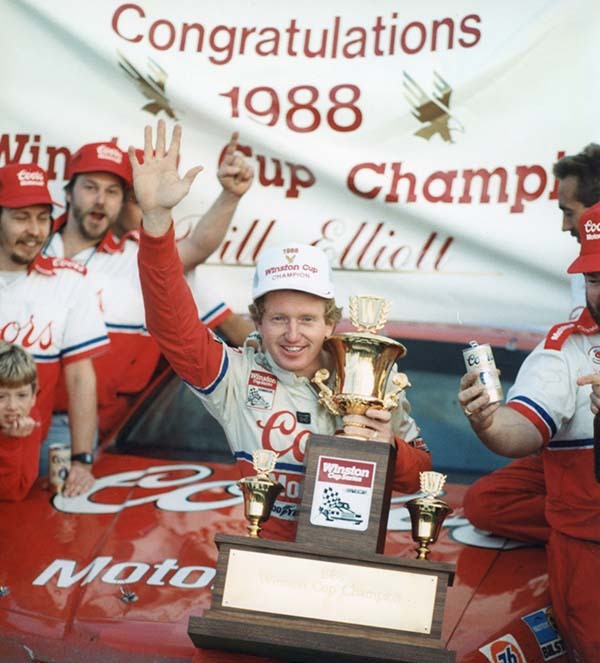 Bill Elliott won the 1988 NASCAR Winston Cup Championship by 24 points over Rusty Wallace after tallying six wins and 15 top-5 finishes. With engine humming and belts tight, Bill Elliott sat behind the wheel of his Harry Melling-owned Ford Thunderbird ready to race. He was on pit road at Atlanta International Raceway on Nov. 20, 1988, waiting for NASCAR’s command to start the final race of the season. The Georgia native was only 328 laps away from winning the NASCAR Winston Cup championship and fans packed the grandstands to capacity in hopes to see their native son pull off the biggest accomplishment of his then 12-year career. Throughout a remarkable season where Elliott finished no lower than 19th in 29 starts, victories at Bristol, Daytona, Pocono, Darlington and twice at Dover set the stage to lock the Cup series title at the 1.522-track superspeedway. A 79-point lead over Rusty Wallace, driver of Raymond Beadle’s Blue Max Racing Pontiac, offered a comfortable cushion if mechanical problems didn’t curtail his efforts. Elliott only needed to finish 18th or better in the Atlanta Journal 500 to make his dream happen. Wallace won the pole position, led the most laps and went to victory lane for his sixth time that season. Elliott qualified a distant 29th and raced conservatively, looking at the bigger championship picture rather than an afternoon victory. Only by an excellent yearlong performance of six wins, 15 top-fives, 22 top-10s and six pole positions could Elliott have put himself into a position to win his crowning achievement. Elliott’s 1988 championship actually began three years earlier when he won the Winston Million bonus for winning the 1985 Southern 500 at Darlington (S.C.) Raceway. Even though the championship was lost to Darrell Waltrip that year, they continued working around the clock in 1986 and 1987 in search of the title but twice fell short. There were many challenges but over time, the modest North Georgia race team George Elliott and sons Ernie, Dan and Bill built from scratch transformed into one of the greatest record-setting championship organizations in NASCAR history. “To me, you’ve always got to lose a championship to win a championship,” Elliott said. “For us, we lost ’85 to come back and win (races) in ’87 and we let several get by us. We were constantly right there in the points year after year. We had some stupid stuff happen throughout some of the years and we finally addressed that and got things back on track, but, all in all, it’s been a rollercoaster. For the Elliott family, the 1988 NASCAR Winston Cup season was truly one of their very best. Before the 1988 NASCAR Winston Cup season started, William Clyde “Bill” Elliott was already considered one of the premiere stock car drivers in the country. His accomplishments had been many, but what had been the most compelling force behind his success and popularity was the 1985 season. In that year, a man who had been simply a young driver from Dawsonville, Ga., was transformed into a superstar. He turned the competition on its ear. Elliott won 11 superspeedway races behind the wheel of hos Melling/Coors Ford Thunderbird. He won the inaugural Winston Million by capturing victories in the Daytona 500 at Daytona Beach, Fla., the Winston 500 at Talladega, Ala., and the Southern 500 at Darlington, S.C.
His reward was a $1 million bonus from R.J. Reynolds Tobacco Co.
With only a handful of races left in the season, he was comfortably ahead of Darrell Waltrip in the Winston Cup point standings. It seemed he would have little difficulty in claiming the ultimate prize – the Winston Cup championship. But something happened. He did not win it. Over the course of the final events of ’85, Waltrip plied consistency against Elliott and snatched the championship away, thereby robbing his rival of his crowning glory. By the second Bristol event in August, Elliott had assumed the points lead on the basis of his consistency and four victories. However, he was in a war with defending Winston Cup champion Dale Earnhardt and the rising Rusty Wallace, and aggressive driver who was hitting his stride with the Blue Max/Kodiak team. In September, Elliott won two more times. After his win at Dover, Del., on Sept. 18, he was 127 points ahead of Earnhardt; 139 ahead of Wallace. The margins weren’t insurmountable, but they meant his rivals would have to beat him, whereas he could implement a more cautious strategy if he chose. However, something happened. Wallace became the hottest driver in NASCAR. He set a torrid pace in an all-out effort to wrest the championship from Elliott’s hands. In October, he won consecutive races at Charlotte, N.C., North Wilkesboro, N.C., and Rockingham, N.C. It should have been more than enough to take the points lead but it wasn’t. The reason? Elliott remained consistent. He never faltered. Where Wallace won, he finished fourth, sixth, and fourth. Hence, Wallace was able only to whittle away at Elliott’s lead, not hack and chop into it. Elliott held a 79-point margin over Wallace going into the inaugural Checker 500 at Phoenix, Ariz., on Nov. 6. It stayed that way after Elliott finished fourth and Wallace fifth. The title would thus be decided at the season’s final event, the Nov. 20 Atlanta Journal 500. Elliott needed only to finish 18th to win the championship for the first time. That event will go down as a NASCAR classic. It was the perfect example of a challenger doing his utmost while a crafty veteran thwarts him. Wallace won the pole, led the most laps and won. He could do no more. Elliott, meanwhile, plodded through qualifying and wound up starting in 29th place. He raced no one. He trod his way through the field as if it were mined. He ran a pace that was at best conservative and at worst downright slow. But, as he said so many times, “I did what I had to do.” He finished 11th, one lap down to Wallace, and the Winston Cup crown was his. It was by no means a spectacular way to win a title, but it was all Elliott had to undertake. Wallace also accomplished everything he set out to do, but it wasn’t enough. A feisty sort, Wallace was understandably disappointed over the outcome. He couldn’t fathom winning a race so decidedly only to lose a title to a driver whose main ambition was to stay out of everyone’s way. The Winston Cup championship is indeed Elliott’s crowning achievement. It is remarkable, too, when one considers that his team began competing on the full schedule in 1983, just five years ago. Since then he has won 29 times, claimed the Winston Million, won The Winston and earned 33 pole positions. Success has changed Elliott. It thrust him out of the Georgia Mountains and into the public spotlight. When he was first blinded by those lights in 1985, he found the adaptation difficult. He’s never been out of the lights since, but he has learned to adjust even though he yearns for a far simpler life. Life certainly wasn’t simple in 1988. Elliott went through the expected rigors of weekly racing – rigors which are firmer for him because of his personal involvement with nearly every aspect of his team and car – and withstood the pressure of a tight championship chase. GNI: OK, the Atlanta Journal 500 is over and you’ve won your first NASCAR Winston Cup championship. No one has to tell you about the pressure you experience or anything like that. So, when it was over, what was the first thing you felt? GNI: You were 79 points ahead of Wallace before the race started. True, you were in the advantageous position, because you were the one who could, shall we say, stroke. It was Wallace who had to go all out. Still, there was always room for a mistake or problem. How did you feel the night before the race? ELLIOTT: Going through 1985, everything I went through that year, helped me. I was able to handle the pressure a lot better. In ’85, I was thrown into a lot of different things. But this time I was able to maintain what I needed as far as making sure the car was right. I had confidence in the people back at the shop. That’s where ’85 was a little bit of a missed year. We weren’t experience and we had kind of a burnout that year, although I don’t feel we really did anything else wrong. In this business, you’ve got to lose a championship to win a championship. That seems to be the rule of thumb. We lost ours in ’85 and so did Rusty this year. He had a good year and did what he had to do, but so did we, All we could have done at Atlanta was lose the championship, but we stuck it out. GNI: Speaking of losing the championship, you did have a good day at Atlanta in that nothing went wrong with the car. But there was one incident – a flat tire. And during the pit stops, you crew went under the hood and that raised a lot of eyebrows. What happened? ELLIOTT: Apparently, somebody left some debris on the track under one of the cautions. My left-front tire went down and I had to run two laps on it and the thing was coming apart. I came in and we put four fresh tires on the car and then I went back out. I went back to the pits one more time. We wanted to make sure we didn’t have a problem. That’s why the crew looked under the hood; to be sure the tire hadn’t caused any other situations. Everything was OK and we went back racing. I don’t know what caused the flat, because I had already slowed down under the caution and then it just went flat. Evidently it was something on the track. Anytime we go into the pits, we check all the tires. That’s why some of the guys were at the back of the car, too. It’s common procedure. GNI: Is there more satisfaction to this championship because of the way you lost it in 1985? In other words, is it nice to be able to have the advantage going into the last race of the season after such a close loss three seasons before? ELLIOTT: Everything had its place. We won the Winston Million in ’85 and we won The Winston in ’86. Then we had a good end of the season last year. This year has had its ups and downs because of the tire wars, the new cars being thrown at us, all if the competitors out there who are really pushing – let me tell you, there’s a lot of good race cars out there and you just can’t go out and ride around. You won’t finish anywhere decent, because with 100 laps to go there are still 15 or 16 cars in the lead lap. You still have to run hard. Sure, we didn’t run hard at Atlanta. As I’ve said, we did what we had to do. That’s what we came here for. So to win it after that we’ve accomplished in the past and with the competition we face today, yes, that makes it very, very satisfying. GNI: You’re saying you didn’t run hard at Atlanta, because there just wasn’t a need. ELLIOTT: I ran just hard enough. GNI: Did you run a set lap time all day? ELLIOTT: No, we just wanted to make it. The way the cautions were coming out, I knew I would be in good shape. Even if I was a lap down and still running decent, I was in good shape. That’s fine; that’s all I needed to do. You could play it another way – I could have run wide open at the front. But it could have turned out like it did for some of those other guys. I could have blown out a tire and hit the wall. GNI: Did you find it hard to drive that way, with that conservative pace? ELLIOTT: It made the day a lot longer, that’s for certain. To me, all the years leading up to this year weren’t as long as that Atlanta race. All those years didn’t seem as long as that race. GNI: Your team has been just that from the beginning – yours. Or more precisely, your family’s. It started small, grew a bit and then with help became what it is today. It’s come a long way in a short time. Is it all hard to fathom? ELLIOTT: As consistent as we’ve been, it’s still been a hard road. We didn’t start running all the races until 1983 with Harry Melling behind us. And then we got Coors behind us in ’84 and then Motorcraft. With all of that, it still seems like a building process. I think this race team is better organized and more consistent that it’s ever been. And I feel like it’s still got some ways to go. Sure, I want to come out and win every race. But we’ve had ups and downs all year long. Yet, we’ve been consistent. Now, looking at 1989, well, we’ve already been to Daytona to test the ’89 car. As far as we’re concerned, there’s not time off. We want to go into 1989 working just as hard as we did in ’88 and any other year. There are that many more competitive cars in the garage area. With a new car coming out, we’ve got a lot to learn. Rusty is going to have his same car and he’s going to be hard to handle. But I still feel this team has more to learn; has more ground to cover. I think we’ll do both and we’ll continue to be consistent. As long as we do that, we’ll win races and championships. GNI: Did you ever drive such a conservative race as you did in Atlanta at any other time in your career? ELLIOTT: I ran what I needed at Atlanta. I know I’ve said that before, but that’s the way it was. I had to run hard because I couldn’t give up anything to the other guys. There were a lot of cars running good. Let me explain the difference. If this had happened five or six years ago, I could have gone out and just run around, not caring about any positions at all. You can’t do that any more. There are too many good race cars and I emphasize “too many.” Yes, we did what we had to do. GNI: Was the car capable of winning the race? ELLIOTT: Hmmmm… It didn’t matter. We did what we had to do (laughs). GNI: At one point in the race, I believe, you were as high as seventh place. Was there ever the temptation, especially then, to just cut loose and let the car do its thing? ELLIOTT: Why? There was no reason. Sure, I would have liked to have won a race in front of the hometown crowd. But I had won six races and I had won a lot of races in my career. But I had never won a Winston Cup championship and that’s what I wanted. The championship meant more than a lot of wins. Sure, I wanted to win races and I always will want to win. But when it comes down to doing what you have to do, I’m sure that all the other drivers who have been in the same position to win a championship have done the same thing. GNI: Did you have any problems in qualifying? When you ended up starting in 30th place, I suspect there were a lot of concerned fans. ELLIOTT: We didn’t have motor problems or anything like that. I thought we were a little off in qualifying but we stood on our time for the simple reason we anted to get ready for the race, especially because of the weather. I didn’t figure it would make any difference if we started 21st or 30th. Or 3th. I started 38th in Daytona and won the race. Where we started was irrelevant as long as the race team did what it had to do. And it did. That’s all there was to it. The only thing that concerned me about the race were tires. I tried to run the kind of pace it would take to conserve the tires. The tire problem I had was due to it being cut down under the caution. GNI: In ’85, you went out and ran as hard as you could. Then Darrell Waltrip won the championship and he didn’t have as dominant a record as you did. He certainly didn’t have the reputation for going out and winning race after race as you did when you won 11 times. Do you feel a bit vindicated now that the shoe it on the other foot? ELLIOTT: I went into this race reflecting on 1985. I thought about the Dover (Del.) race. I remember I had Darrell a lap down within 60 laps. I had my car running faster than it ever did. Then I turned around and had wheel-bearing problems, I had this problem, I had that problem. Even here, I can remember running like Rusty did this time. I went out, ran hard and won the race. At several points I had Darrell nearly a lap down. But when it was all over, he ended up finishing fourth. So I know how Rusty feels. He went out and threw everything he had at us for the last five or six races. But we stayed consistent. That’s the way it was in ’85. Darrell stayed consistent. I did it this time. I know how it feels to do it both ways. GNI: Other than the title, what was the biggest highlight for you on ’88? ELLIOTT: Winning at Bristol. Of all the circumstances that happened in that race, I still won it. The short tracks spoke for themselves in ’88. We sat on the outside pole at Martinsville and finish sixth. We finished fifth at North Wilkesboro. I had a bit of a problem at Richmond and finished seventh. At the second Bristol race, I finished second to Dale. We stayed consistent. Then we went to Dover and won and won again at Darlington. Then we hung on at Rockingham and Phoenix. Looking back, there was no one key race, just a combination of them where Rusty could have gained and we could have lost. I feel like with the point spread we had going into Atlanta, it was a little but of a relief but I had nothing in the bag until the race itself was over. GNI: So it was the best year you ever had on short tracks? ELLIOTT: Absolutely. Looking back at Daytona in February and the two Talladega races, they were disappointing. Daytona in July was fantastic because we started way back, worked hard and still won that race. I had a good car and it ran all day long. That’s been the key all year long. The Winston Cup circuit consists of about 12,000 miles for the whole year. To win the title says a lot for the group of guys to put equipment together to make a car that would last for that many miles. GNI: What role do you play in your organization? It’s a family deal with Ernie and Dan, but are you the leader? ELLIOTT: I don’t know if I’m necessarily the leader. It’s kind of a split deal. No one realizes the role I play. I try to tell people that I’m into decision making, but I also sweep the floor. I work as hard as I can. I’ve stayed late and I’ve left early. I’ve tried to make sure everything was done right on the cars. I’ve got the right people in the shop. They’ve come in and taken hold. They’re willing to work and done everything they’ve needed to do. The year says it all. I contribute what I can. I’m more of a friend than I am a boss. I try to make sure we’ve got everything organized as to where we need to go and what we need to be doing. I play just as much a role in that respect as Barry Dodson (Wallace’s crew chief). GNI: Did you and rusty ever make contact at Atlanta? By that, it’s meant did either of you exchange looks, eye contact or anything of the like? ELLIOTT: I felt like his car was going to finish and I hoped my car was going to finish. That was about it. GNI: From a personal standpoint, how do you feel about your accomplishments? ELLIOTT: As I’ve said, very relieved. I feel there’s a big load off my shoulders. It means a lot to me. I say that from deep down inside. All those guys back at the shop sweat, work and put in the hours they do. It’s as much for them as it is for me and I truly mean that because I’ve been there. I was the sole one who worked on the cars in ’81 and ’82, so I know what it is like to put in a lot of long, hard hours. When you get to this point… I just wish every guy in the shop could say publicly what it meant to them. GNI: Did you ever dream there would come a title in ’88? ELLIOTT: We never doubted we could achieve it, but we tried to take on day at a time. We’ve tried not to anticipate or dream about things. We just wanted to make sure we were prepared. After we won at Atlanta and took the championship, it was the same way. We first went out and celebrated; had a good time with all the guys who did the work. Then we went on and tried to prepare for next year; to get ready for the next championship. GNI: What do you know about the ’89 Ford Thunderbird? ELLIOTT: Not much. We’ll know more after testing. I’ve driver the car, but it was pretty much of a shakedown deal. And we helped prepare the Ford for Lyn St. James to run for those records at Talladega, but that really didn’t tell us much because that car wasn’t NASCAR legal. It taught us how to package things more than it told us what to do. No matter what we do, next year will be a guess. I think it is going to be a pretty tough year. We don’t know that much about the car and there are going to be so many more competitive cars. And Rusty is going to be very, very tough, as I’ve said. GNI: In ’85, your battle with Waltrip put you against the master of verbal intimidation, if you care to call it that. What was it like going against Wallace this year? ELLIOTT: Even if Rusty had been able to be verbal, it wouldn’t have made any difference. In ’85 against Darrell, we were able to take it in stride. I don’t see where it would have been any different now. I think the organization is better. When you’ve got quality people, everything is done right and the rest will come. I don’t see how any team can stand there and say, “We’re going to do this, and we’re going to do that.” You can’t do that with the amount of good teams there are. In this business, you can’t say what you are going to do or what you are going to do to someone else. You just take what you can get. GNI: Wallace was frustrated after the Atlanta race, of course. He won, led the most laps, won the pole and did all he could do to win the championship from. Do you empathize with him a bit? You’ve been there. ELLIOTT: You look back about what I said about Darrell. I had him out at Dover and at other places where I ran good. But I had problems. Rusty still had the luck with him, but he found himself in the position where all I had to do was just what I did in the last race of the season. It will all come back. It will come around and it will be his turn someday. GNI: You’ve said how important the championship was for you and your team. Was it equally important for your team owner, Harry Melling? ELLIOTT: Absolutely. When I went into Harry’s office with Ernie back in 1980, we were just a couple of country boys from Georgia. We talked about what we would like to do. He said to put a program together for races. I remember sitting there and thinking that Harry felt we could do it. I’m just glad to be able to say to him now, “Hey, we’ve done it.” We did it because of him. It’s been through all of us, but he was the key part. He took us from the point where we couldn’t go any farther. GNI: Now that you’ve won the championship, you are going to find yourself in front of the media and the public even more often than you already have. Is that going to mean more work, work you really don’t enjoy? ELLIOTT: No, not really. I’ve been through a lot of that stuff. If you do well, it’s part of it. If you don’t, well, it’s still part of it. I’ve learned that. GNI: You’re not always an easy man to get a hold of. Your schedule is pretty hectic and it’s going to get worse. How are you going to deal with it? ELLIOTT: I’ll deal with it as it comes along. My main concern is getting ready for the season. GNI: Is being the champion going to affect any changes on the team? ELLIOTT: It’s no different than it has been. I’ve got good people. I’m going to continue to delegate responsibilities and do my part. GNI: From 1985 to 1988, you have made adaptations professionally. You’ve made that clear. Now tell us how you have changed personally. Are you more mature? More confident? ELLIOTT: I feel like I’m still the same person, but I do think I’ve matured and I do have more confidence. I think I have smoothed over a lot of the rough edges. I still have a lot to learn as far as how I need to deal with certain situations. I guess with certain inexperience in that and with where the team was based, well, they were negatives from that standpoint. It was especially tough to learn how to deal with everything. I had never been in the spotlight until 1985 when I was thrown into such a deal with the Winston Million and the press and attention that got. That was a tough year. It would have been tough for Richard Petty or anyone else who had been through all that. I think it helped me for 1988 as far as going through it all again. I learned how to deal with it. I think the experience of ’85 really helped me. That’s the big difference in me from now until then. GNI: What was the biggest aggravation of 1988? ELLIOTT: There wasn’t probably any one thing that was bad. The tire war got to be an issue. It was tough mentally because it wasn’t a type of decision where you could simply say, ”I’m going to run one tire or another.” You had to wait and see. It was like you might go into a race for 200 miles before you decided to change brands of tires and you couldn’t find time to do it. That was the hardest part of that deal because there were so many people out there who could put them on and who could put you a lap down. That was a bad situation. GNI: Would you like to see it change? ELLIOTT: I don’t see how you are going to change it. As long as there are two tire manufacturers in the sport, it is going to be tough on everybody. It’s cost us a lot of money. But in the long run, didn’t Goodyear come out with a better product? The last several races proved that. Now, I’m sure Hoosier will go to work hard over the winter to beat that although it’s hard for us to see that as far as the short-term deal is concerned. GNI: How is your relationship with your brothers as far as the work, ordeal and success have gone? Are you farther apart or are you closer? ELLIOTT: I think we’re closer. I think at times we grew farther apart, but now I think we are closer than ever from the simple standpoint that we all see where we are going. We know what we are doing. We are in this racing game and we’ve got experience at it. We’ve done a relatively good job at it and it’s where our roots are. It’s where we are going to continue to go. If we grow and work toward our goals, that’s what it will take. GNI: Clear up a rumor. It’s been said that you are in the process of buying the team back from Melling in a year-by-year process. Is that true? ELLIOTT: No. As long as Harry wants to be there, he’s there. We haven’t tried to do anything. When he says, “I’m ready to quit and you guys can buy it,” we’ll deal with that. We’ll accept that. He’s stood by us through thick and thin and I admire him for it. GNI: In a sentence, give us your impressions of Rusty Wallace. ELLIOTT: Hmmmm… My impressions of Rusty? I don’t know if I can give them in a sentence. He’s kinda wild, kinda hyper. He’s just a go-at-it kind of guy. GNI: Do you see a lot of Dale Earnhardt in him on the track? ELLIOTT: To some extent. Dale is Dale and Rusty is Rusty. And I’m me. That’s where we all differ. We’ve all gone through a lot of hard times. Dale and I, as far as the situations have happened in competition, is an example. But we see eye-to-eye as far as his points and my points. We respect each other and I think we grew to that. GNI: Do you expect the same with Rusty? ELLIOTT: We respect each other now. He’s a heckuva racer. Like I said, I know how he feels. It hurts to lose. But that is what makes you a winner. GNI: You obviously feel to win the championship a second time will be harder than the first, given what you’ve said about the competition, Wallace and the like. ELLIOTT: I’m sure it si going to be harder. We’re already at a disadvantage. We are having to build new cars and whether they are better or worse has yet to be determined. We are using new stuff. New is good, but having to work out the new stuff may take time. We may hit it right off, it might take a third of the season or half the season. It may be a tough half season. That’s the bad side of the deal. GNI: Of the drivers you see out there today, can you spot the next Bill Elliott? ELLIOTT: No. Our deal is unique. That’s what I like about my situation. This team was built by us, with some outside help. But that outside help wasn’t a group of people who came from other teams. We had influence from other people, like Bud Moore, Leonard Wood and Jake Elder. They were men who gave us advice and helped us pick up knowledge. But still, it was us. I look back on this team and it’s record over the last five or six years and it is totally amazing. To come out of nowhere, to come from where we were in 1980 to now… There’s been no other team like it. Sure, there have been other winners and champions, but they bought people. They used other parts from other teams and put it together. Don’t get me wrong. Everyone works hard. We’re no different from any other team in that respect. Yet, we’ve been able to find out the things we need and work toward our goals largely by ourselves. I don’t think you will find that anywhere else in NASCAR. Where we have been really lucky is that we’ve been able to stay together. You can put everything else aside that has happened to me or the team. You can put aside every other reason for our success. The real, honest reason is that we have simply stayed together and worked together to reach our goals. And this Winston Cup championship was the one we really wanted and worked hardest to get.